A month! 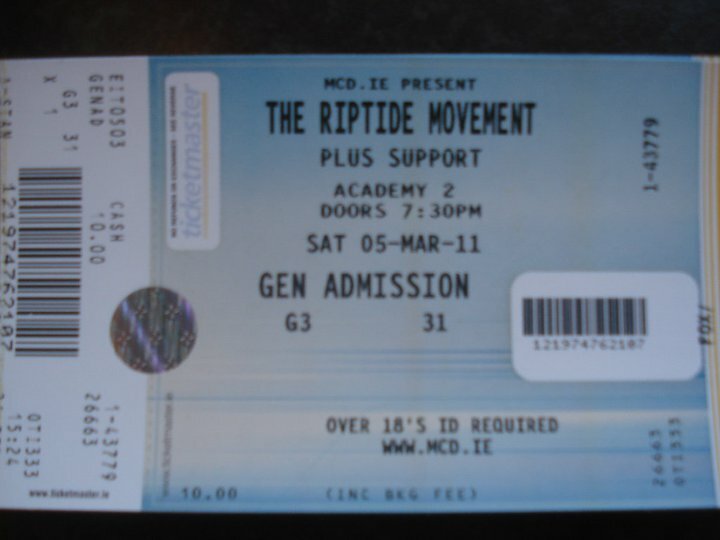 That’s how bloody long it’s taken us to knuckle down and tell you how good The Riptide Movement were at the Academy on March 5th. Whoever said Tickets There was a lazy blog owes us a serious apology. With speed like this we may even be considered for expulsion from the Irish music scene we hold so little presence on. Aside from the delays, blurry memories and drunkenness that was ensnared us at The Riptide’s gig in March, we are happy to report that they rocked the place to it’s core. Not only that, but they managed to out play, out last and upstage the Go Team who were holding court in the venue’s main room on the same night. Having missed the opening acts of the evenings, Tickets There and a completely packed out Academy were treated to an hour and a half of excellently performed blues rock from one of Ireland’s brightest hopes in guitar rock for 2011. There was the hits from the forthcoming album including Hot Tramp and new single Keep on, Keepin’ On as well as a sizeable chunk of material from their début, What About The Tip Jars. There was an orchestra, there was crowd participation. Hell, there was even attempts at crowd suffering when things really heated up. Without going into half fictional details due to the whole beer, lack of notes and goldfish like memory, we can honestly say it was one of the best Irish shows we’ve been to in yonks. The band’s practice of playing live every five seconds is ensuring their sound is delivered as good as any seasoned band and their songs are getting better by the day. With gigs beginning to exceed expectations in every way, you can bet that The Riptide Movement is a name you’ll be hearing a lot more of over the next few months. ….but no matter how good they are, we will never encourage them or any other Irish band to play the same stage as The Kings of Leon, no matter how good of an opportunity it is! Damn the KOL to hell! This entry was posted on April 7, 2011 at 1:27 am and is filed under Gig Review, IRISH NOISE!, Music with tags Hot Tramp, Keep On Keepin' On, The Academy 2, The Riptide Movement, What about the tip jars. You can follow any responses to this entry through the RSS 2.0 feed. You can leave a response, or trackback from your own site.